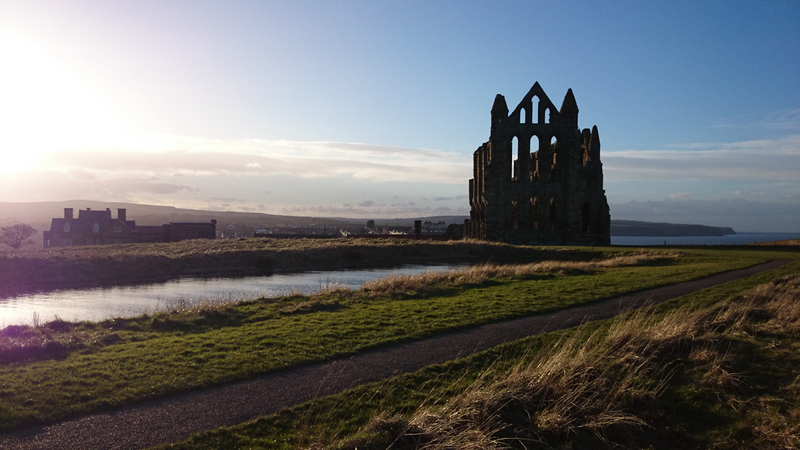 A seaside town steeped in history, Whitby on the Yorkshire Coast is a pretty and atmospheric place in which to spend a weekend. Driving from Leeds took around an hour and forty minutes, and the views as we passed through the moors and descended into the town were fantastic. We stayed at the Riviera Guest House on Crescent Terrace near the West Cliff, whose owners were happy to accommodate us by providing soya milk and a tasty vegan cooked breakfast (their vegetarian breakfast is entirely vegan when ordered without eggs). While there aren’t any dedicated vegetarian or vegan restaurants in Whitby, thankfully we managed to find decent vegan options in regular places. As Whitby is a fishing town it naturally has a large number of fish and chip shops, but we saw one which fries chips in vegetable oil – Robertson’s, on the left after you cross the bridge. It’s always good to see chip shops that use vegetable oil, because many in Yorkshire fry in beef dripping (cow fat, in other words) – which means the chips aren’t even vegetarian, let alone vegan. (note: Robertson’s have confirmed to me that they fry chips separately from the fish and meat products, but a reader has told me that other items labelled vegetarian on their menu may in fact be fried in the same oil as the fish – making them non-vegan and non-vegetarian. Please check this out for yourself before ordering). After a bracing walk along the windswept beach, where we spotted a starfish in a shallow pool, we headed to The Jolly Sailor on Saint Ann’s Staith along the waterfront. The Jolly Sailor is an old fashioned pub decorated with nautical pictures and ornaments, and it’s also a Samuel Smith’s, where the beers are not only drinkable and cheap, but also pretty much entirely vegan. Sam Smith’s pubs also have real log fires, and a pint of Extra Stout and a roaring blaze warmed us up nicely. Whilst I liked their beer I wasn’t too keen on eating in The Jolly Sailor (though Sam Smith’s do offer an entirely vegan meal – the sweet potato curry), and so we headed to the Passage To India on Windsor Terrace, next to the train station. After checking it was dairy free I ordered the vegetable bhuna with pilau rice and a couple of chapatis; the curry was a bit oily, but certainly not the worst I’ve ever eaten. The restaurant also serves Cobra, a smooth beer that goes really well with curry and is, of course, vegan. The next morning the weather had improved and we decided to walk to Robin Hood’s Bay, a village that’s a decent six and a half miles hike away across the cliffs. Climbing the 199 steps and passing the Church of Saint Mary and its graveyard made famous by Bram Stoker’s legendary bloodsucker Dracula, our walk began near the impressive ruined Benedictine Abbey on the East Cliff. The sea views as we walked along the clifftops were spectacular, though the powerful winds made the hike slightly treacherous and we were glad to reach Robin Hood’s Bay, with its scenic, sweeping seashore and cluster of cute cottages. Wandering through the quaint old village we were amused to read about a naughty blackbird, who apparently has rather a taste for apples and pears. Whilst waiting for the bus back to Whitby (which leaves from Thorpe Lane at half past the hour) we met a very friendly cat, who was very keen to be fussed over and petted. After the hike we were quite hungry, and in search of pizza we headed to Moutreys, located on the first right over the swing bridge, on Grape Lane. Moutreys have a number of vegetarian options and ordering the Frutti di Terra pizza without mozarella (its other toppings are tomato, roast Italian vegetables, artichoke, red onions, olives, garlic and herbs) ensured it was vegan. The pizza, cooked in a wood fire oven, was very good – though guaranteed to deter Dracula, as it was liberally topped with garlic. Before heading back to our guest house we had time for a pint at the other Sam Smith’s in Whitby, The Plough Inn on Baxtergate – the pub isn’t as cosy as the smaller Jolly Sailor, but it’s certainly warm and welcoming. We had a nice time in Whitby, despite the rather cold and blustery weather, and I’d definitely recommend a visit to this charming coastal town. Do you know of any other places for vegan food and drink in and around Whitby? Please let me know in the comments below. If anyone out there is planning a visit to East Kent & wants vegan eating options then here’s a start: Beano’s Cafe, 43 Tontine Street, Folkestone. CT20 1JT – Reasonably priced vegan & veggie food. 4 stars out of 5. The Wallflower Cafe, The Mall, 116, High Street, Herne Bay. CT6 5JY – Reasonably priced vegan food. 5 stars out of 5. Seaside Cake Parlour, 24 Hawley Street, Margate. CT9 1QA – If you have a sweet tooth then this place is Heaven for you but phone ahead & check that they are open as sometime they close early to deliver wedding cakes, etc. 5 stars out of 5. The Veg Box Cafe, 17B Burgate. CT1 2HG – Very inexpensive vegan food. 5 stars out of 5. Also we have Zizzi at 53 St. Peter’s Street, Canterbury, CT1 2BE & also at 11 Horsebridge Road, Whitstable, CT5 1AF which both offer a choice of vegan food options but if you want vegan beer or wine you’ll need to ask. 3.5 stars out of 5. Further to this, if you’re planning a visit to London ,you could do a lot worse than Mildred’s. There are three restaurants, one in Camden, one in Kings Cross & one in Soho. All very busy, very bright, very noisy but the food is excellent. 5 out of 5. This is really helpful as we are visiting the area this weekend & want to take a look at Staithes, Whitby & Robin Hood’s Bay. We did a similar run up to The Lake District for last year’s Whitsun Bank Holiday weekend & only found out about a vegan diner on the morning we were leaving to drive home. If we find any other vegan friendly places I will add another comment next week. Also, as we are from East Kent I will add another comment today, listing vegan eating places in the Garden Of England! It’s a couple of years old now, so please do report back with any updates on vegan options in Whitby! The cat is called Rocky and no longer lives in Robin Hoods Bay, he belongs to my son and his family who live in East Yorkshire. He (we think) hitched a lift in a removal van and was missing for over a year. The lovely people at the Victoria Hotel fed him in the car park every day until he got in a scuffle with something and they took him to the vets for a check up and his chip was scanned. He is home safe and well but still loves fuss from anyone/everyone!! Thanks for the update, what a great story! Glad to hear Rocky is back home safely. Thanks for this… lifesaver! Panicking about going to Whitby! The Vegan Punk Robertsons is also pushchair friendly. Chips often seem the only option in Whitby so thanks for this. I’m always surprised at the lack of a vege / vegan cafe there , I reckon it would be a goldmine in the summer months ..
Yeah I thought the same. My partner and I were saying a vegan/veggie B and B would be a good idea. Saltburn By The Sea is worth a visit, and the tea rooms down by the miniature railway offer vegan sandwiches (cheese and spread) and Swedish glacé. Still haven’t been there! Must try and visit. Thankyou The Vegan Punk. My brother & I haven’t been back to Whitby for a few years now. We used to stay at a guesthouse/B&B which had some good Vegan options. Can’t recall the name of the place now & don’t even know if it’s still there. An old guy ran it & the decor looked like it hadn’t changed since the 1920s. This time we decided to do the cheaper option of self cater & stay on a campsite. Folly Gardens on Green Lane seems to be the nearest to the town & is reasonably priced so that’s where we’re headed this weekend. I didn’t know about the Sam Smiths pubs in Whitby & I think we’ll be sinking a few Soverign Bitters in the Jolly Sailor. Last time we were there (at least 7 years ago!) we thought it safer to leave the chips well alone as we know that the majority of Yorkshire chippies proudly cook their chips in dripping so now we know of Robertsons, great! Will also be checking out Passage to India & Moutreys. I’ve made notes from this blog & am taking them with me. Will report back with any new Vegan-ness in Whitby we might find when we return home. You’re welcome Graham. Let me know if you find any other vegan options. This article is a few years old now so I’m sure there must be some!